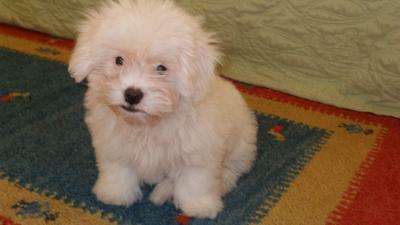 Tica, is my three month Coton de Tulear. I was looking for a dog like that for many years and finally I found this wonderful breed, here in Brazil. Tica is a sweet dog, very kind, but, when she starts to play... she is really a Brazilian bombshell!!!! Thank you for your warm e-mails. I'll send you more pictures next month!Tica is a Brazilian nickname.It means " little pretty girl". Congratulations to you for finding your perfect little girl. She is sure adorable and we wish you many happy years with her. --Would love to see more pics of her as she grows up, thanks for sharing. I'm very proud about your comment,dear Charlotte!!! I hope Tica gives me all joy you have with your Lola!! What a beautiful Coton. She is absolutly gorgeous. Enjoy ur new puppy & let us know the fun antics she decides to get into.